A Disobedient Girl is the story of two Sri Lanken women, Latha and Biso. Latha is a young girl, a servant of a wealthy Sri Lanken family, and her best friend is Thara, her masters’ daughter. Thara and Latha remain best friends until they are in their teens, when a huge wedge comes between them and instead of Latha being banished from their home, she is sent to be Thara’s servant in her home with her new husband, Gehan. In alternating chapters with Latha’s story, we have Biso’s story. Biso is a mother with three young children who one day gathers up the courage to leave her abusive husband with all three children in tow. The four of them journey to the home of a distant cousin, with Biso hoping and praying that this family member will find it in her heart to take in her and the children and thus save them from her terrifying husband. When I first began reading A Disobedient Girl, I have to admit that I was a bit confused. The stories of Latha and Biso are told in alternating chapters, but the format of their stories are very different. Latha’s is told in third person, over the span of many years, and Biso’s is told in first person, over the course of only a few days. While this really threw me for a loop in the beginning of the story, once I got used to the format, I really got involved in these women and their stories. Both Latha and Biso were just so easy to sympathize with. Latha was a servant, but she always had a feeling that she was better than “just a servant” – that she was every bit as worthy as the family she worked for. Unfortunately, this feeling is exactly what got her into trouble as a teenager and caused her and Thara to stop being best friends. Even with all the troubles and issues in her life, though, Latha always stayed true to herself. She wasn’t always proud of her actions, but she always felt like she had just as much a right to act a certain way or have certain things as Thara did. And as an adult, when Latha basically raised Thara’s children without the help of either of their parents, it was so easy for me as a reader to empathize for Latha and feel the love she had for those girls through the pages. Biso was easy to sympathize with because she loved her children SO much. Her love for them was palpable. She took so many chances in this story, so many risky moves just because she felt as though she had no choice but to get her children away from their abusive father. She knew they could not grow up thinking that it was okay for a father to treat his wife in the ways that her husband treated her. The amount of turmoil and strife that Biso and her children went through in just a few short days was astounding. But through it all, Biso was amazed to see how much her children loved one another and depended on one another for support – even moreso than they depended on Biso herself. While reading A Disobedient Girl, I kept thinking that these two stories had to be related somehow. It may have distracted me a little from the reading, to be honest, trying to figure out how Biso and Latha’s stories intertwined. But it all came together in the end, and all my guessing could not have prepared me for the ending to this book. It was definitely dramatic, definitely heartbreaking, but I think it was a perfectly rounded out novel, looking back on it. The book definitely made me upset but it was an excellent read and now that I’ve had a few days to think on it, I really appreciate how everything came together. Ru Freeman really is a fantastic author, and I absolutely hope to read more from her in the future. 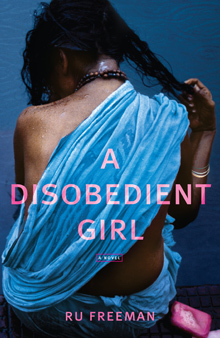 A Disobedient Girl was truly a stunning novel, one that I won’t soon forget. I read this one for a TLC Book Tour. Thanks to the ladies of TLC as well as the author for this opportunity! Yay! I absolutely LOVED this book so I’m happy to read others did too! I know! It was pretty wonderful. Great review!! Can you imagine having to go be a servant for your BFF and her new husband? That could throw a little wrench in the relationship! Thanks so much for all the time spent on reading and reviewing this book! It is much appreciated. Wow, I love a book that keeps me guessing until the end. This one sounds fantastic! ooh I’m excited to read your review!! Wasn’t that ending crazy?! Really enjoyed reading your thoughts on this one. I’ve been wanting to pick it up sometime!! I was confused at first, too. It took me awhile to stop wondering how the stories were related and just let everything unfold. Love a book that can surprise me. I’ll have to check it out!